Voice Over Talent and Professional Voice Actor Rick R. Voice Overs For Television, Radio and Film..
Rick has a polished voice and the experience to match. Soft and touching tones to powerful and dramatic copy read with great enthusiasm for TV and Radio commercial projects and and even balanced tone for industrial needs. Rick has been a radio and television voice talent for over thirty years and has fully produced thousands of radio and television commercials. Along with serving dozens of regular clients across the United States, Rick currently voices news features daily for Gannett media and USA Today online/Satellite Radio. US clients include numerous Automotive dealers and retail outlets, Casinos and TV promo imaging along with many industrial reads and television projects currently under development. Rick is also heard around the globe in Australia, New Zealand, Europe and the UK on English speaking TV commercials. Ricks unique voice, acting ability and wide range allow him to read for most all male parts with the exception of teenagers and little guys. Senior and Middle age and younger adult male parts and characters. Rick works each day from a State of the Art Voice and Production studio. High end equipment and a great facility guarantee top quality audio for your voice project. Putting all of the parts together and making them sound great is an art and Rick has truly developed this skill. Put Rick to work on your large or smaller project. All types and forms of sound effects and musical selections are available for your needs. Are you an audio gear head? Then you would be impressed! Don’t really know a Spangledoffler from a Freebitz? Don’t worry about it. It is OK because I do and you will HEAR the difference. Voice Over Talent, Radio Imaging, Narration, Network Promos, Automotive Voice Talent, IVR Voice Talent / Message on Hold Voice Over Talent, Animation Voices / Character Voice Actor, Movie Trailer Voice Overs, . 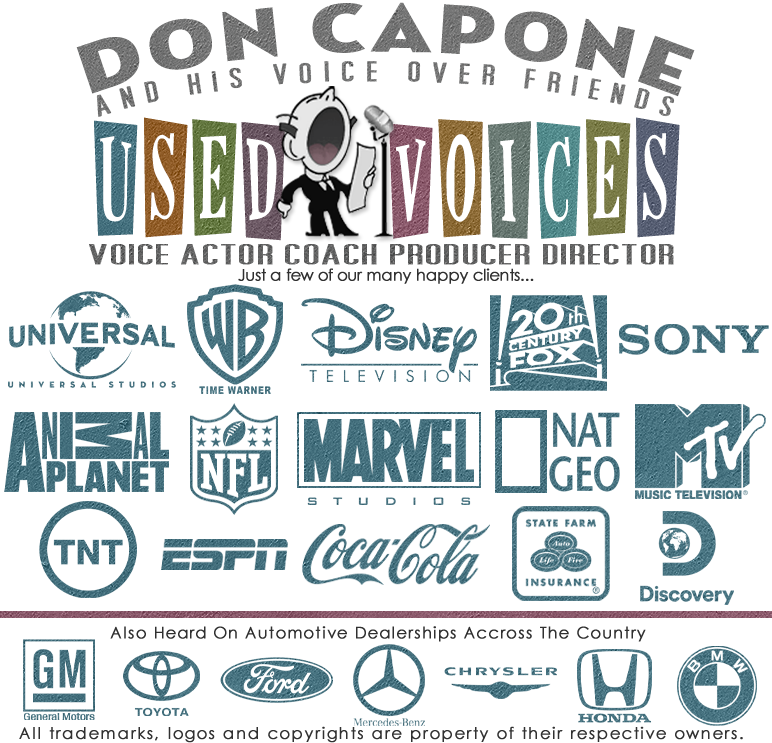 Voice Actors and Professional VoiceOvers from Voice Over Actors. , TV Commercials, Movie Trailer Voice Overs, Documentary Narration, Automotive, Video Game Animation and Cartoon Voice Overs Find Voice Over Talent for Radio Commercials.